Today we leave in the morning and head Northward of "the city in the sky" towards Thika, past Blue Post Inn - unique with its twin waterfalls Chania and Thika Falls. Continue eastwards until the slopes of Mt Kenya, Naro Moru where mountain forest gives way to valley grassland. Unique birds to this area include, Eastern double collared sunbird, Alpine swift, Black Chested snake eagle, Narina Trogon, Scaly throated honey guide, Mountain Wagtail, White headed wood hoopoe, African Black Duck, Grey Cuckoo shrike and Yellow-bellied waxbill. Dinner and overnight stay at Naro Moru River Lodge / Serena Mountain Lodge. Spend the whole day birding at this Mountain Lodge with montane forest. Rare species likely to be seen include; Green Ibis, Lesser Spotted Eagle, Harrier Hawk, Rufous Sparrow hawk, Ayre's Hawk Eagle. Black stork, Red Fronted Parrots, Green Ibis Common snipe, Mountain Buzzard, Bronze napped pigeon Mountain white-eye, Abbots Starling, Sharpe's Starling, Mountain Oriole and Thick-billed seedeater. Dinner and Overnight stay will be at Naro Moru River Lodge / Serena Mountain Lodge. We leave in the morning and head for Lake Bogoria with a stop at the Nyahururu Waterfalls, there are possibilities of sighting Chestnut-Winged Starlings, Slender billed starling, Rock Martin, Grey cuckoo shrike around the waterfalls. Proceed on by road into the Great Rift Valley and onto Lake Bogoria National Park. 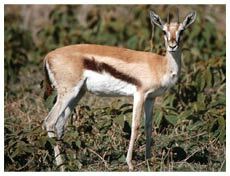 The shores are always lined with Gazelle, Zebra, Baboons and this is one of the best places to see Greater Kudu. Dinner and Overnight will be at Lake Bogoria Spa Resort. Depart for Lake Baringo, well known by many avid Ornithologists as Mecca for Birds, with 500 species of birds having been recorded. Explore this area with field birding around Lake Baringo, it's environs, the Cliffs and the bushes. There are possibilities to see rare species like, Cape Eagle Owl, White-faced Scops Owl, Jackson's Hornbill, Hemprich's Hornbill, Brown-Tailed Rock Chat, Northern Red Bishop, Northern Masked Weaver and White Billed Buffalo Weaver, Olivaceous Warbler, Northern brownbul, Jackson's golden backed weaver, Little weaver, Brown Tailed Rock Chat, Goliath heron, Northern Shoveller, Verreauxs eagle owl, Bristle crowned starling, Senegal Thicknee, Pygmy falcon, Blue checked bee-eater. Dinner and Overnight will be at Soi Lodge. Today we leave lake Baringo and head to an isolated remnant of the equatorial rain forest that once spread over Africa from west to east. It contains an excellent representation of bird, animal, and plant species including an array of primates. Kakamega forest through Eldoret. Kakamega forest's aviauna is rich and unusual in its composition. Two globally threatened species reside here, Chapins Flycatcher and Turners Eremomela. 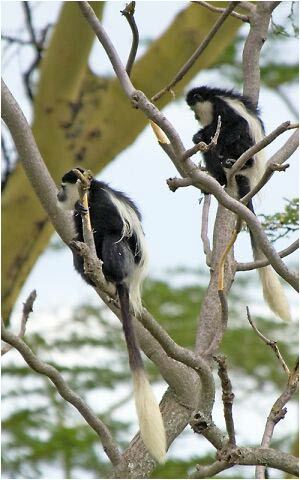 The aviauna is unique not only nationally but also continentally; the forest holds large populations of Black and white colobus and Red tailed monkeys among others. Dinner and Overnight stay at Rondo Retreat Center. Full day bird walk at the eastern most extension of the great tropical rain forest stretching from west Africa. This forest is renowned for its uniqueness and richness in bird life and species like, Turners Eremomela, Black billed Turaco, Great blue turaco, Cameroon Sombre Green bull, Little grey Green bull, Yellow Bellied Wattle eye, Purple-throated cuckoo, Hairy Breasted Barbet, Grey breasted Illadopsis, African Grey Parrot, Square tailed drongo and Chapins Flycatcher. Lunch, Dinner and Overnight stay will be at Rondo Retreat Center. We depart this morning after our breakfast and head southwards to the shore's Lake Victoria, our bird walk will be focusing on the Dunga beach Swamp. This site is home to one of the most reliable sites in Kenya for the scarce and threatened papyrus yellow warbler. Papyrus Gonolek, Swamp fly catcher, Marsh Tachgra, Jacksons golden backed weaver, Red chested sunbird, Sedge warbler, Carruthers's Cisticola, Southern red bishop, Northern brown throated weaver, Greater swamp warbler. Lunch, Dinner and Overnight tonight will be Imperial hotel / Sunset Hotel. We leave this morning and proceed to Lake Nakuru National Park coloured with a shimmering flamingo pink from thousands of the beautiful birds lining its shores. Nakuru National Park, a shallow and strongly alkaline lake, with surrounding acacia woodland & grassland. Firstly gazetted as a bird sanctuary is, known for its bird life for the thousands of Lesser and Greater flamingos make this lake their home, among hundreds of other Species unique to this area which include, White winged Black Tern, Hilderbrants Francolin, African fish eagle, Steppe eagle, Grey crested Helmet Shrike, Red-capped lark, Spotted Crake. Wildlife is also in abundance here. Lake Nakuru National Park has been made into one of Kenya's rhino sanctuary. Lunch, dinner and overnight stay tonight will be at Sarova Lion Hill Lodge / Lake Nakuru Lodge / Flamingo Hill Camp. Depart for Lake Naivasha morning bird walk or boat ride (Optional), the only fresh water rift valley lake in Kenya. It's unique in that its' freshness is maintained by a combination of underground out flow and sedimentation of salts. The lake supports a diverse water-bird community, with more than 80 species recorded regularly. It is a significant site for Red knobbed coots, African spoonbill, African jacana and little grebes depending on water levels. Lunch, dinner and overnight at Lake Naivasha Sopa / Lake Naivasha Simba. Drive across acres of wheat and barley to Masai Mara. The Masai Mara Game Reserve, is regarded as the most magnificent natural theatre in the world. Set in the heart of Africa's Great Plains, the Masai Mara boasts 1,672 square kilometers of unspoiled wilderness. It is home to the highest concentration of animals and birds anywhere on the continent. Lunch followed by an afternoon game drive. Dinner and Overnight stay Mara Sopa Lodge. Two full days in the Masai, the extensive grasslands are a strong hold to the threatened, migratory Corncrake and the near threatened Jackson's widowbird. The bush and woodlands around the reserve also hold some unique bird species, more than 450 bird species have been recorded in the Mara, including 12 species of cisticola and birds of prey. Large numbers of palaerctic migrants winter in the area including Caspian plovers and white storks. Other local and unusual birds in the Mara include Rock Cisticola, Rufous Bellied Heron, Denham's Bustard, Black Coucal, Red Tailed chat, Pale Wren Warbler, Tabora Cisticola, Yellow Bellied Hyliota, Green-capped Eremomela and Magpie Shrike. All meals and Overnight stay will be at Mara Sopa Lodge. After breakfast, we drive back to Nairobi arriving in time for lunch at Carnivore restaurant. Thereafter you will be transferred to the airport in time for your International departure flight or drop off at your Hotel. Use of safari vehicle for game viewing.